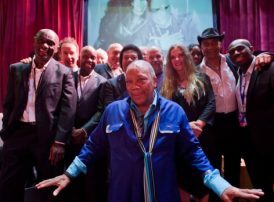 On Sunday, The AllStars Collective were the house band for an ‘Evening with Quincy Jones’ at the Britten Theatre in London’s Royal College of Music. The AllStars performed a bespoke Overture to celebrate Quincy’s work as well as acting as House Band to back the 10 guest artists, including Jocelyn Brown, Hamish Stuart, Beverley Knight, Mica Paris, Sarah-Jane Morris, Kenny Thomas and Sonique that appeared to honour the great man. The AllStars appeared as a 16-piece lineup including five horns, four backing vocalists and a full rhythm section. Promoter Rocco Buonvino engaged The AllStars to produce all of the music elements of the show which ended on a grand finale with all the guest artists and house band joining kids from the Royal Docks Community school singing ‘We Are The World’ along with Quincy himself.